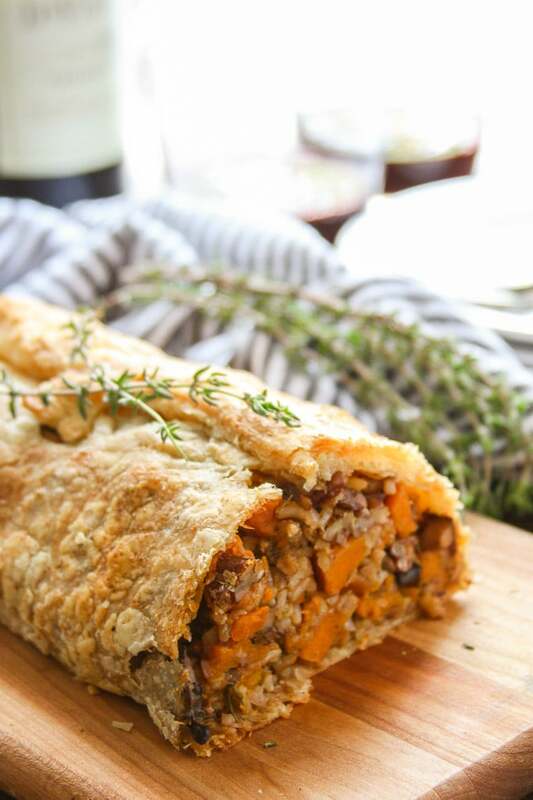 Flaky puff pastry is stuffed with a sweet and savory mixture of mushrooms, butternut squash, pecans and rice to make this mouth-watering vegan vegetable Wellington. 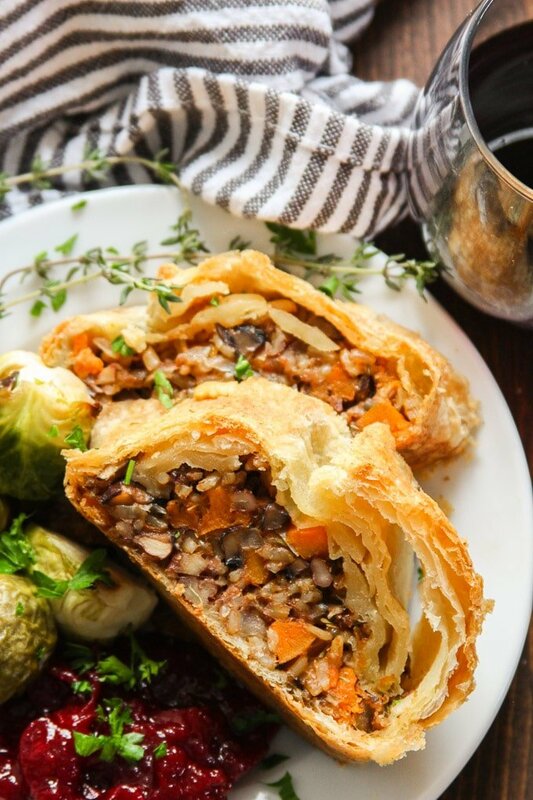 This stunning holiday main dish that will please vegans, vegetarians, and omnivores alike! This recipe is carb-o-riffic. But hey, if there’s a day when you can go all out on the carbs, it’s got to be Thanksgiving. Vegan Thanksgiving recipes certainly take the cake (ha ha! Um, sorry.) when it comes to carbing things up. This one is puff pasty stuffed with carbs. And it’s SO good. This dish is kind of based on beef Wellington, but it’s also kind of not. 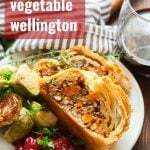 I’ve wanted to create a vegan beef Wellington (or at least a vegan beef Wellington-inspired dish) forever, but didn’t know where to start. See, beef Wellington is basically a big piece of meat and a few other fixings wrapped in puff pastry. Great! So I’ll wrap some vegan food in puff pastry. But just about anything you wrap in puff pastry is delicious. So what would I use? See my dilemma!? In the end I decided to go with carbs. Puff pastry isn’t exactly health food, and since we’re already going there, why not go all out and indulge? Great, let’s do just that! I decided to assemble a bunch of sweet and savory fillings, wrap it up and call it a day. I ended up with a whiskey-spiked mixture of mushrooms, butternut squash, pecans and herbed brown rice. Start by roasting your squash and mushrooms. 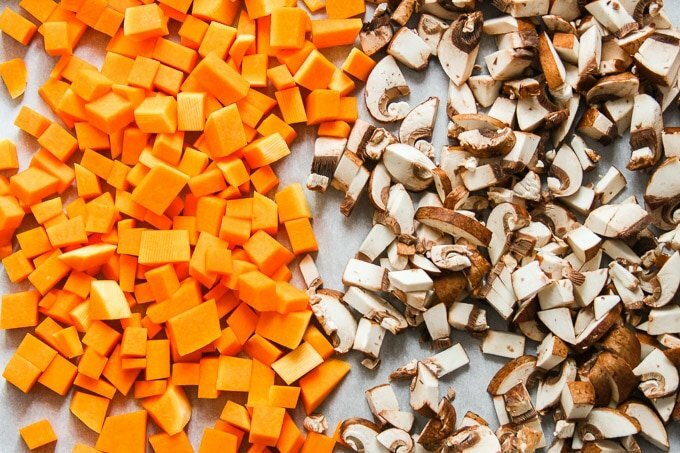 Roasting is the most efficient way to cook up butternut squash, and while you’re at it, might as well throw the mushrooms in too. While that happens, cook up the rice in veggie broth with some savory herbs. Here’s where all the fillings come together. Sauté some onion and garlic in olive oil, and add the whiskey. Once that cooks off, throw everything else in: the rice, the mushrooms and squash, and some pecans. Sprinkle with a bit of flour (this helps with binding) and mix everything up. Roll a sheet of puff pastry into a large square, and then pile your filling up along the center. Fold the ends over your filling, and then the sides, pinching all of your seams to seal them up. Brush the whole thing with melted vegan butter and score it a few times with a sharp knife so steam can escape while it bakes. Bake until golden and puffy. Dig in! This dish is best eaten right away, since puff pastry loses it’s crisp, flaky texture as it sits. You can make the filling a day or two in advance though. I’m also betting you could assemble the whole dish in advance and freeze it before baking. Then, on the day of serving, thaw it out and bake it according to the recipe. This recipe makes a lot of filling. It should all fit (press it together tightly! ), but if not, don’t force it — you’ll run the risk of your puff pastry tearing. Just squeeze in as much as you can. Wait, doesn’t puff pastry have butter in it? Surprisingly, lots of commercial brands of puff pastry do not! Pepperidge Farm is pretty readily available and it’s vegan. Can I skip the whiskey? It adds a delicious flavor, but if you’re not down with alcohol (keeping in mind that the alcohol will cook off), feel free to leave it out. Feel free to substitute your favorite variety of rice. I really like the texture of brown rice in this dish, but just about anything will work. You can also substitute a different variety of winter squash (like pumpkin or kabocha) for the butternut. Even sweet potato should work. For anyone who hates mushrooms: just leave them out and include some extra squash and/or pecans. Place the rice, broth, thyme, sage and rosemary into a small saucepan and set it over high heat. Bring the liquid to a boil, lower the heat and cover. Allow the rice to simmer for about 40 minutes, until the liquid is fully absorbed. Remove the pot from heat and allow it to sit with the lid on for at least 5 minutes before uncovering. While the rice cooks, preheat the oven to 400° and line a baking sheet with parchment paper. Toss the squash with 1 teaspoon of olive oil and and toss the mushrooms with 2 teaspoons of oil. Arrange them separately on the baking sheet. Place the baking sheet into the oven and bake until the squash and mushrooms are tender, about 20 minutes. Remove the baking sheet from the oven but leave the oven on. 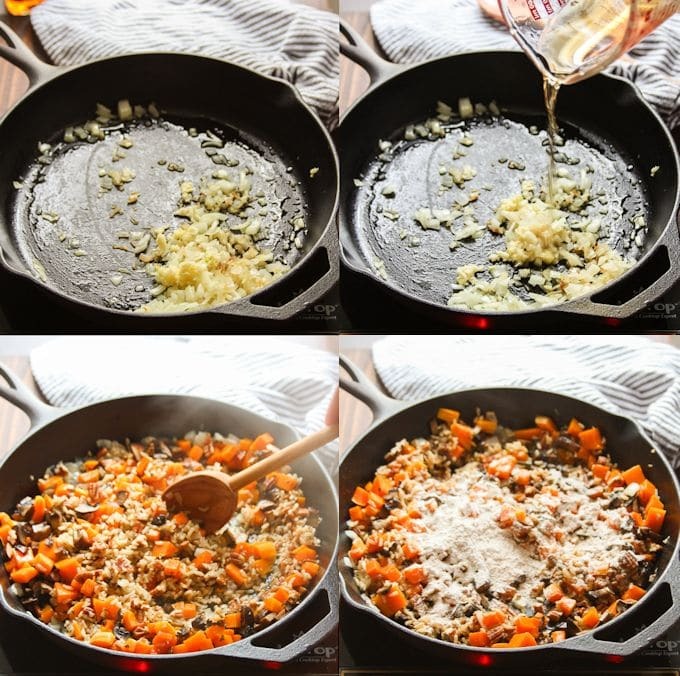 Coat the bottom of a large skillet with the remaining tablespoon of olive oil and place it over medium heat. When the oil is hot, add the onion and sauté until soft and translucent, about 5 minutes. Add the garlic and sauté another minute, until very fragrant. Add the whiskey and let it simmer for about 2 minutes, until most of the liquid has cooked off. Add 1 cup of the cooked rice (you might have a tiny bit leftover. Use it for something else, or make a snack of it. ), squash, mushrooms and pecans to the skillet. Stir a few times to mix everything up. Sprinkle the flour over the mixture and stir to incorporate. Remove the skillet from the heat. Place the puff pastry on a lightly floured work surface and roll it to about a 12-inch square. Transfer it to the baking sheet. Pile the filling on the puff pastry, forming a long rectangle extending down the center of the puff pastry sheet. Shape the filling with your hands and pack it in. It should seem like a lot, but you can remove some if it's way too much. 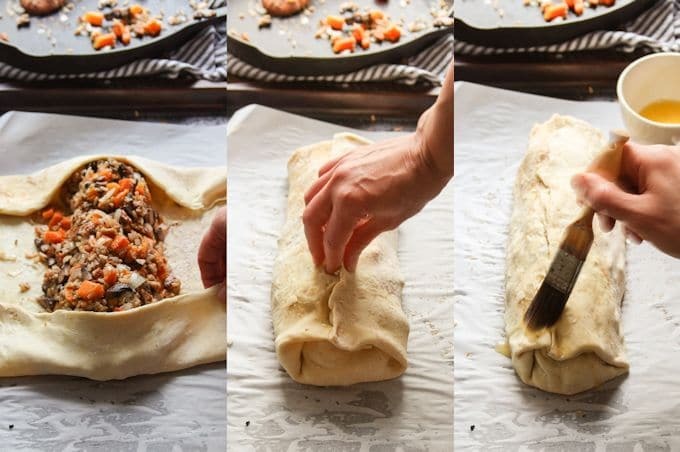 Fold the top and bottom ends of the puff pastry over the filling, then wrap the sides overtop to form a log shape, pinching tightly at the seams to form a seal. Brush the pastry with the melted butter and poke a few holes to allow steam to escape. Bake the log until golden and puffy, 30-35 minutes. Allow it to cool just for a couple minutes, then slice and serve. Can I come live at your house for the month of November? I think this will be somewhere on our holiday menu this year. Keep it up! Lol. I could certainly use some help getting rid of all the Thanksgiving dishes I’ve stashed away in the freezer! I hope you enjoy this! 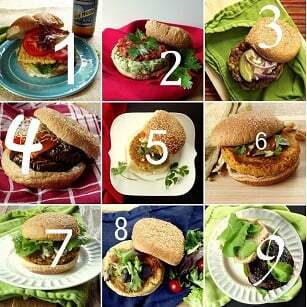 you are my “go to” place for the best recipes and ideas for my kind of dishes. Thank you for always presenting the very best! Aww…thank you so much! I’m so glad to hear that!! What can I use for the whiskey? I cannot have any because of a family who needs to avoid alcohol. Do you think you could use whatever blend of veggies desired as long it totals 6 cups? I was thinking mushrooms, carrots and peas. Or mushrooms and sweet potatoes! Yup! Just about anything will work! Just keep in mind that softer veggies will roast quicker, or in some cases (like with peas) might not require roasting at all. Enjoy!! I bet this would be great in a spring roll wrapper!!! I would like to make this into small mini puffs for a party….more like mini appetizers. Have you done that? How did it turn out. This sounds delicious. A couple of things: the written portion of this recipe says ‘roast squash and rice’…. I guess you mean squash and mushrooms which is pictured,..? Also, what is the baking temp? I must have missed it somewhere. 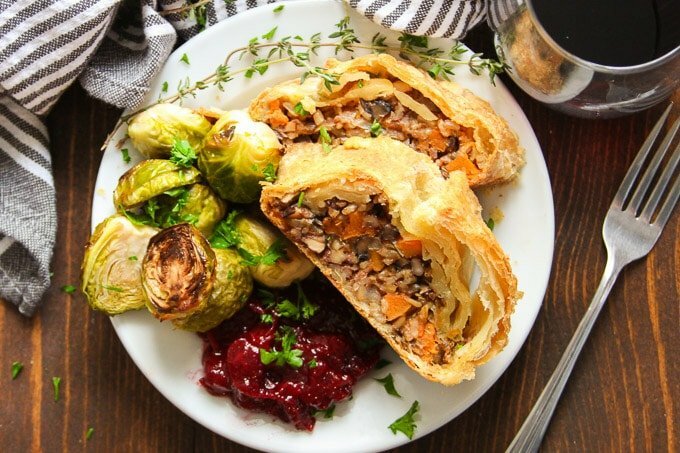 I am making and bringing to non-vegan house for Thanksgiving – should be a hit… nothing bad here! Thanks for catching the “squash and rice” thing! I just corrected that! The baking temp is 400° – step 4 says to preheat the oven to that temp and then step 7 says to leave the oven on after the squash and mushrooms come out. I hope you enjoyed the dish! About how many oz of mushrooms are needed to get to three cups diced? About 8 ounces should do it! Yay!! I’m so glad you both enjoyed it! Thanks so much Natalie! Would you recommend some sort of gravy with this, or is it moist / hearty enough on its own? I’m wondering if I can add some cooked French or black lentils to this to up the protein? Maybe instead of the mushrooms? I think that would work very nicely. I’d love to hear how it turns out if you try it! This dish is amazong. I made it with a friend to see if it would be appropriate for Christmas and it definitely fits the bill! Imwas wonderingmif it’s possible to assemble the whole thing in the morning and refridgerate until ready to bake and serve so i dont need to be preparing while after guests arrive. This was a delicious and photo-worthy Christmas dinner. This will be a new tradition for the family. Thanks so much! Holy moly, this was good. I’m vegetarian and volunteered to make the main dish for my family’s Christmas dinner—they’re omnivores and picky so I knew I had to make something savory and homey! This was labor intensive but a smashing success. I added chopped carrots to the squash and mushroom pan, toasted the pecans a bit before adding them in, and mixed in Parmesan cheese at the very end. SO tasty, they all loved it! Thanks for your recipe, it definitely saved Christmas!! Yay! I’m so glad it was a hit! Thanks so much Daphne!